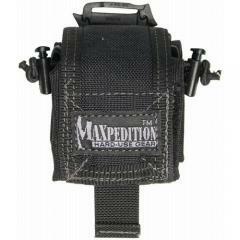 The Maxpedition Mini Rollypoly is the smallest of their family of folding dump pouches. It attaches to MOLLE or PALS webbing using three-inch TacTies, or mounts on a belt using the integrated loop. Its ultra-compact folded size makes it easy to carry and takes up minimal space on your webbing platform. When expanded, it provides enough space for a 32 ounce water bottle, making it extremely useful for travel. It comes with a tough bungee cinch cord to close the top securely, as well as a Velcro flap that can be used for additional protection or tucked away for easier access.